In 1985, Hillsborough resident Cliff Lundberg sought education and socialization services for his youngest daughter who is developmentally disabled. He found what he was looking for in Parca Organization. Founded in 1952, PARCA Organization provided needed programs and services dedicated to enriching the lives of developmentally disabled clients and their families. When Mr. Lundberg joined PARCA’s Board of Trustees, he saw the need to raise both awareness of the organization in the community and more money to supplement government funding. Until then, PARCA Organization’s only fundraising activities consisted of a thrift shop and membership dues. Mr. Lundberg saw the opportunity for a larger and more organized fundraiser. 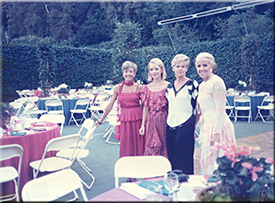 He turned to a small group of creative and generous women who “knew how to throw parties.” He dubbed them the “decorating committee” and this energetic group included Jane Jackson, Barbara Brown, Sharon Dolin and Maureen Gilmartin. The first fundraiser, which raised $25,000, evolved into an annual luncheon and fashion show. 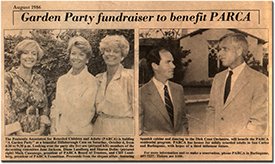 The Auxiliary was officially founded in 1988 to provide annual financial support for PARCA. Lisa Miller, who was on PARCA Organization’s Board of Directors, was named the first Auxiliary President. Lisa Miller created the structure and framework for the Auxiliary with the help of Pam Ehikian, Debbie Bocci, Mary Pulley and Vicky Jones. Today, these leaders are still close friends and continue to support the Auxiliary. Many have daughters, nieces and family who have become active in the Auxiliary, like Paige Lundberg Farsad, Kimberly Jackson Wickam, Jennifer Brown Moriarty, Tera Gilmartin, Shawna Pulley Droese, Heather Gilmartin Krumins, Christina Horwitz Tan, Courtney Bocci and Jennifer Dolin Rinehart.